We were getting strawberries and rhubarb in our veggie bag again this week. Last time I had made a strawberry rhubarb crumble pie for our camping trip. Everyone loved it! I was going to make another one of the same, but if you’ve learned anything through this blog, I don’t usually like doing that. And then Alex found this blog post from Bellwoods brewery. 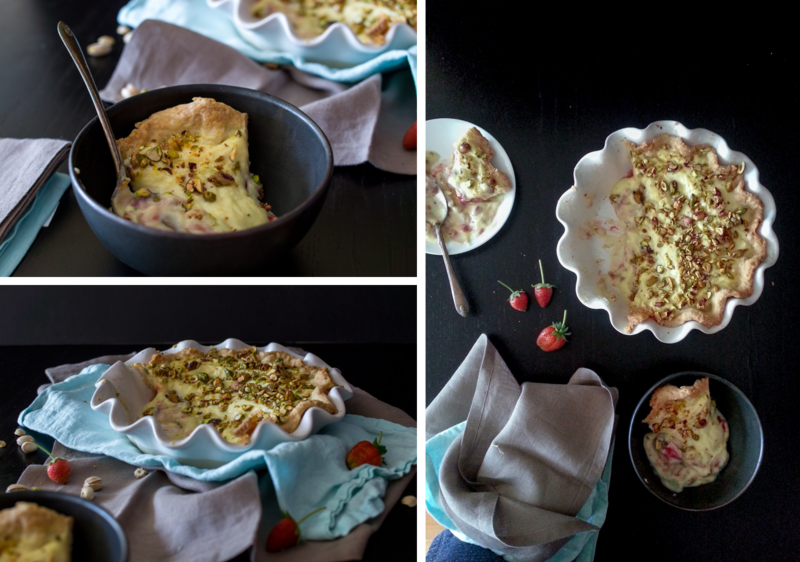 They had a new dessert on their menu to pair with their Omerta beer: a strawberry rhubarb shortcake with cardamom-scented pastry cream and candied pistachios. That sounded so so good. But I was still fixated on making a pie. I had made a banana cream pie the other week when Alex’s brother was visiting, but it disappointed me mostly because I don’t really like banana cream pie. Strawberry rhubarb cream pie though? That sounded like something I could get behind! So I made the perfect pie crust, spread some strawberry rhubarb rose compote on the bottom, smothered the whole thing in cardamom scented cream and let it set. 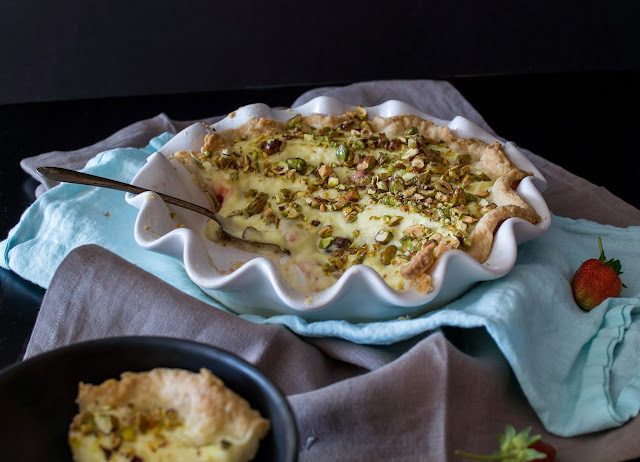 The candied pistachios are just the icing on the cake… or the nuts on the pie. They really make it, adding a delicious crunch to the otherwise soft filling. The filling didn’t set up as hard as I may have hoped, but this pie was so good I couldn’t not share it. Plus I don’t think I’ve ever heard anyone complain when you give them a piece of pie. 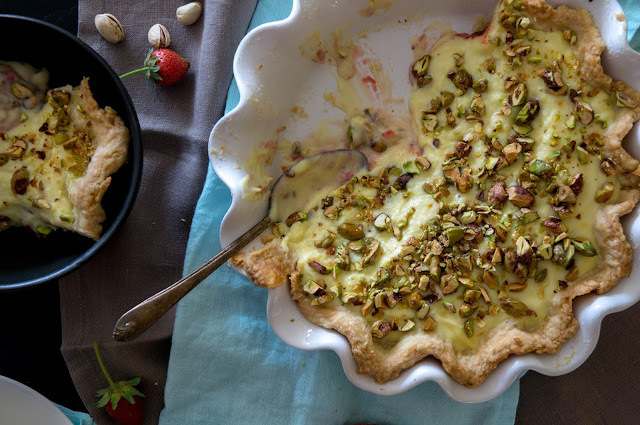 Once the pistachios are on, the pie should be eaten immediately. Otherwise, sprinkle the candied nuts onto each piece individually before you eat it. Leftover candied pistachios can be eaten as a snack, or replace regular pistachios in salads like this one. Thanks to the happy set of coincidences that resulted in this thing of beauty! Set aside about 1/3 of the sliced strawberries. Combine the rest of the strawberries, rhubarb, and sugar in a medium saucepan. Heat over medium until fruit starts to release its liquid and sugar has dissolved. Lower heat and let fruit simmer until the fruit has almost entirely disintegrated and liquid is thick enough to coat the back of a spoon. Set aside to cool. Once cool, gently stir in the reserved strawberries and rose water. In a medium bowl, whisk egg yolks with sugar and cornstarch until combined and lightened in colour. Set aside. In a medium saucepan, heat cream with cardamom pods until just about to boil. Whisking constantly, slowly pour hot cream into egg mixture, so that eggs don’t cook. Strain back into pot and bring to a boil, stirring constantly. Boil, still stirring constantly, for 1 minute. Remove from heat, stir in vanilla. Set aside to cool to room temperature. Heat oven to 350F. In a small bowl, combine pistachios, sugar, water, and salt. Stir until pistachios are evenly coated. Spread on a parchment lined baking sheet. Bake in the center of the preheated oven for 8-10 minutes, stirring halfway through, or until nuts are golden and crisp. Let cool and roughly chop. 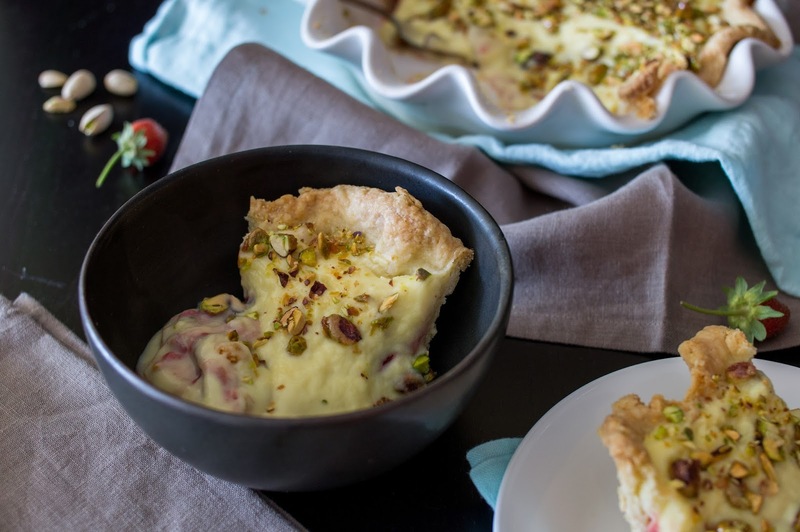 Spread strawberry rhubarb rose compote evenly into the bottom of baked pie shell. Gently pour cream over compote. Refrigerate for 2 hours or overnight to set the cream. Sprinkle with candied pistachios right before serving. Serve with a large spoon!